I sure am glad I am not in NYC, I have no complaints about NM weather. Hold on NYC, that frozen polar vortex is coming to wrap you up. This week’s Boston marathon training was a little mixed up. For the third week in a row I was going to snowshoe race. This race was a 10k, and I dreaded the pain all week. It is not that the race is so painful, I can only go so fast, and at 10,000ft it even slower, it is a whole different pain. It is a problem of my brain not understanding that I cannot make myself go faster no matter what. Once the race is over and I finish coughing up a lung, the following two days are hard. I am not sore nor am I sleepy tired, but I am totally depleted. My morning dog walk is more difficult, and walking up short hills is hard being spent. These were my issues for Saturday that I kept mulling over in my head; 10k snowshoe race with a 100 mile drive, cross country ski lesson 40 mile drive, getting out the door by 6:00 am for the long drive, and worry about the distance, it was 10k, I have only done 4.2 so far, it is the regional competition for nationals with very few runners. I do not care about qualifying as I am not going to Wisconsin to race. Plus I had a 14 mile run Sunday, that I knew I could move it to Monday or even Wednesday if I had to. Boston is still 12 weeks away or is it 13 and I have plenty of 20 and 21 mile runs to do. Finally I don’t like to leave my dogs for so long, as to drive over 200 miles run for 1.5 hours, should I bring them with me? Oh and my feet hurt. My whole weekend changed and my decisions were out of my control. On that morning dog walk before leaving, I chose to skip the race and go to my ski class, my dogs got ambushed by a pack a feral dogs, so we were at the vets, or driving to the vet between 8:30am and 1pm. All was awash and I was emotionally beat. I went for a 6 mile run, stopped in my driveway a few times, committed to go to the end of the road, 1 mile, decided to keep going, but turned around and only ran 3. I felt like I was hit by a bus after the mornings antics. I drank wine instead, something I am trying to completely stop until after Boston and had not drank in 3 weeks. It didn’t really drown my sorrows but it seemed like a good idea at the time. I then get a call from my father who lives in Michigan. He and my sister were driving from L.A. to Chicago and wanted to stop by. This was a great surprise. I had not seen my dad in 2 years, my sister I have no idea when, maybe 6, 7, or 8 years. They came over on Sunday and I had them in my printmaking studio making prints, out on a short walk in a place call Plaza Blanca near my home, and the area local eatery. It was really nice to see them, they stayed until about 3:00, which is too late to start a 14 mile run because it gets dark out. I don’t run here in the dark because it is the number one state in drunk drivers and the abundance of unleashed and feral dogs. It is not because I am afraid of a coyote attack, in fact that would be the least of my worries. Update, I am NOT a winner. I checked the results today to see my overall score in the Chama Chili Ski Classic and it seems there was an interloper! I did not win 1st place in my division, I got second. Dana Price of Albuquerque was first and I am guessing she did not write her birthdate on her registration and that is why she was not originally counted. So I have to give her the credit, she was the fastest. Overall though I am very happy. There was a total of 54 men and women snowshoe races and I came in 16th overall, 6th female, 2nd AG. Next weekend I am registered for a 10k, oh boy, that will be like jumping from road racing a 8k to the marathon I am afraid. But it is all in the name of fun and building endurance for Boston. I am a winner today, but first about the events. 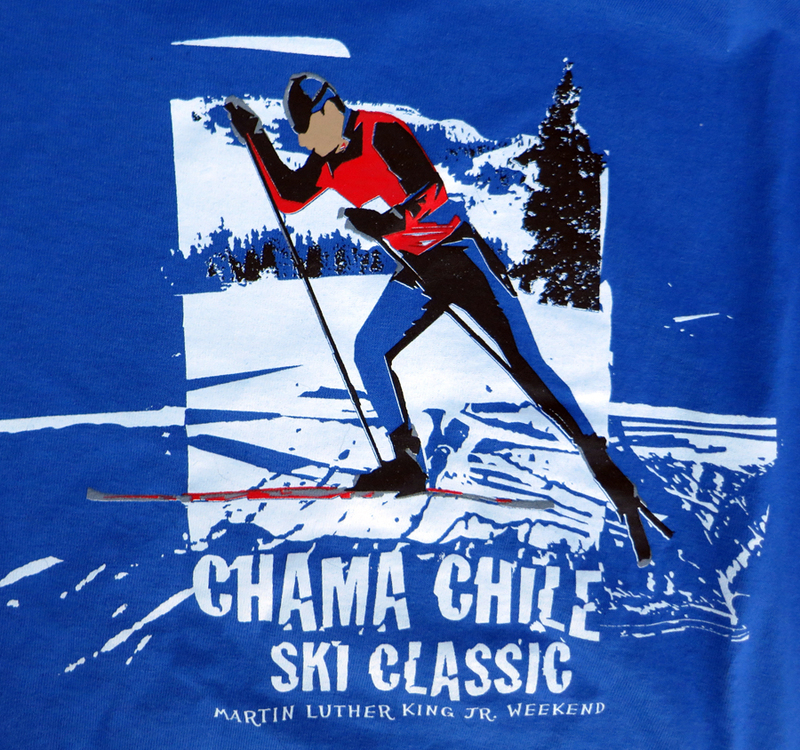 The Chama Chili Ski Classic is a two-day event, of Freestyle & Classic Style Races; Snowshoe Race and Combined Ski/Snowshoe Events. The races are 12 miles north of Chama, NM in Windy Point, Colorado at the Cumbres Pass. This threw me off a bit as my driving instructions were not that specific, but I made it in plenty of time, 73 miles from home. I pre-registered for the 6k snowshoe race, 6k = to 3.74 miles, it was not 3.74 miles, it was 4.22 miles, that is a big difference on snowshoes when you are busting your lungs at 9,902 ft of elevation. Okay, and let’s face it, working harder than I have the fitness for, especially without eating breakfast – dumb move. The course was beautiful rolling hills and loads of snow. I donned my Redfeather Pace Series snowshoes. It is not a racing shoe but a recreational/fitness shoe. It is made smaller for women’s frames and mine is rated to 125 pounds. I am new at this, only my second race so I was not about to put up $300+ for racing shoes. I got mine at SierraTradingPost for $89 and feel pretty smart about it. A guy at the start jumps next to me, almost on top of me asking how much my snowshoes weigh. They are compact, but they do weight over 3 lbs, where the racers are closer to 2lb. Then a women seeks me out asking me my age. She was sizing me up, and yes I was in her age group, groups are a 10 year span. She was ready to race, me, I love the competition, but I am not so ready for the pain at altitude and in snowshoes. We were off, my right leg started doing it crazy thing of extreme pain from the muscle not contracting and I was limping along, unfortunately for almost 1.5 of these beautiful scenic miles. I walked, a lot it seems, but as fast as I could. The women from the start, Laurie, so far ahead I could not see her. But eventually the pain was gone, I was running more than walking and I saw Laurie. She was about 200 meters ahead. i chomped on my TraderJoes Tangerines and set out to catch her. It did not seem promising, until the last 3/4 mile. I got closer, and closer. I passed one of the checkpoints and the marshal said to me, “you look so happy” and while deep down I felt the pain of diminished oxygen, the depression not see the finish line yet, but I was happy, really really happy. With about 250 meter to go and a nice hill ahead I was catching up. But then I see Laurie’s husband, who also raced, run out from the finish and join her. I thought, “crap, if he paces her I am done” so without even thinking I yelled, “if you are going to pace her, you have to pace me too.” I honestly don’t think they realized that’s what they were doing; there was no response then he says, “well you better get up here then.” And I did, I ran, caught them and kept on going. I heard Laurie, say, “I am red-lined.” and she cheered me on, but I was not going to believe she was done. I saw how fast and beautiful she ran in those shoes. My manta had changed from, “God, please let me finish this” to “I want this win.” over and over. I did not look back, I looked only to the finish line. I saw my friend and Santa Fe Strider, Ed, marshaling the finish. I know how hard Ed can push his running, and I was going to do the same. I ran it right through the finish. I had no idea where the other women were on the course or even who they were, and I found out later that Laurie had won the previous year. But this year, I was first in the division, I won, I was thrilled and gasping for breath. After the race I chatted with Laurie and her husband. I am assuming it was her husband. They too are running Boston, though in 2016. We shared are favorite running racing and they got me excited to run int he NM Cup Low 02, a 10K snowshoe racing in Red River, NM, north of Taos, all above 9800ft. It is the regional qualifier for the United States Snowshoe Association National Championships and it is sure to be high competition. Just to run 10k in snowshoes will be a feat, But I am having a blast doing it, so I plan to go. I did not stick around for my prize. Awards were given out much later in the day and I wanted to get home. I have a cool shirt and a nice goodie bag. But I can’t help but think, “if I only had faster lighter racing snowshoes” it is so easy to get caught up in that drive for better and faster. But I see SierraTradingPost has the RedFeather Vapor shoes on sale, maybe they throw a pair my way to review, or sponsor me with a nice pair of racing snowshoes in the next race. Wouldn’t that be cool? Holy Hip Flexors Batman, You scored! First the great news, I won 3rd place, 13th female over all at the Santa Fe Snowshoe Classic. (I desperately need a travel mug and winning one is the best!) 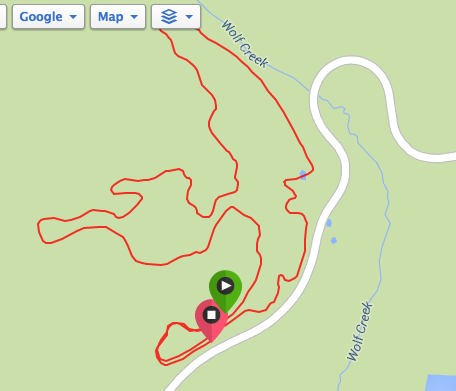 The route was a 3.8 mile clockwise loop consisting of Big Tesuque Trail #152,Winsor Trail # 254, Pacheco Canyon Rd. and unofficial, short but obvious linking trail back to the Big T trail. Start/end elevation is 9640 ft. with 610 ft. total climbing. I felt like I was always climbing. It topped out just under 10,000ft. There was a nice downhill along Pacheco Canyon Road, but it was a climb to Pacheco and a climb after it. It was so much fun! It was a small race, 81 runners all in the woods. I had a few opportunities to be completely alone They had the women start 5:00 after the men to give more room on the single track trail. Though the first 5 women, despite starting 5:00 behind smoked more than 1/2 the men! One of which was in my age group. She is 59 and immediately reminded me of Katherine Martin – she is an incredible runner. Snow was not great, it was hard packed but I hit about 5 places of dirt and rock, no snow. The whole time I was running I felt pure joy and my hip flexors. The day before I took a cross-country ski lesson, part of the UNM community program in Los Alamos. The instructor, Hans-Peder Hanson and his wife Sue who taught the class are both Division 1 college skiers, NCAA award-winning racers. I have not checked them out on-line, well just enough to know they went to Dartmouth, but it is obvious by watching them move that they excel in the world of ski competition. The class meets every Saturday for 2 hours for 2 months. 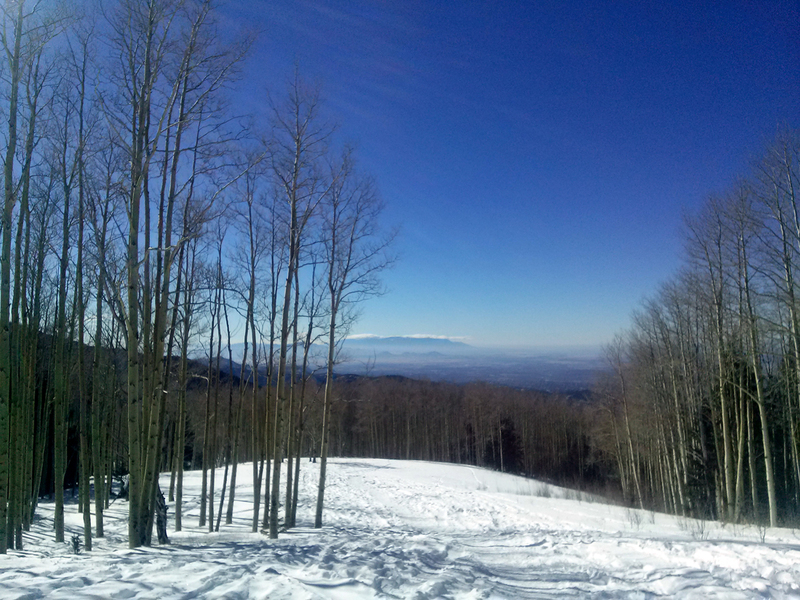 This week we met at Pajarito Ski Mountain. I would stop it at my hip. I also learned to open my hand up as it goes back, like the guy above. My biggest issue? I get tangled up and move the same size arm and leg forward. For example, I move my right leg forward and my right arm. It is crazy, so I start my motion by walking with my skis so that I alternate arm and leg. After two hours and up and back gliding, within a 150 meter track I could feel my hip flexors were tired. After driving home the 45 miles, they were a little more tired. At night they woke me up several times, or was that the dogs on my bed pushing me into a little ball so that could not stretch out? Anyhow when I started today, it was hard to lift my knees, it got better a mile in and pretty good near the end. But as I type this, oh boy, they are spent. 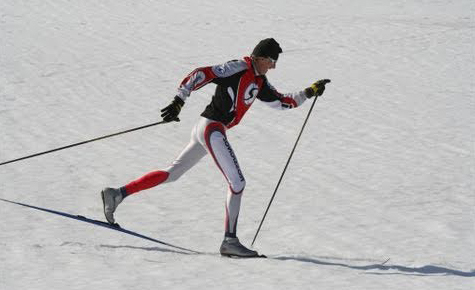 Next weekend there is another snowshoe race and x-c ski race. I would like to run the snowshoes and watch the ski race. 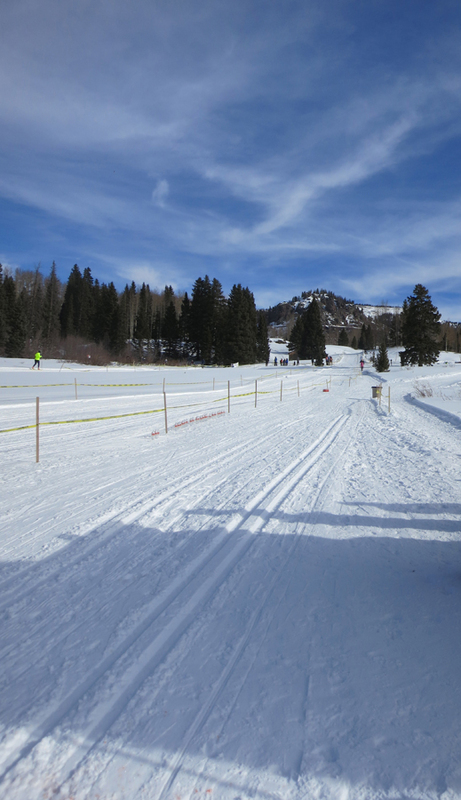 It is part of a weekend long festival in Chama called Chama Chili Ski Classic. it begins on Friday and runs through Monday. There is beer tasting, music, pasta dinner, chili cook off, yoga, 2 days of racing, fat tire snow bike race, more music, more chili. It looks like a blast! It is 60 miles one way, but I think Sunday I may head up there. I think this snowshoe race increased my lung capacity by at least 50%, maybe 100! I sure busted a lung out there and it was delightful! This is a huge plus in aerobic building for the Boston Marathon come April.